The following is an excerpt from a piece that I have recently written for The Archbishop Sentamu Academy Teaching and Learning site. The focus is on support for staff who are not in their NQT year. Follow this link to read the full article with guidance on Responsibilities, Cover Lessons, Entry/Exit Routines…. This is your second year as a teacher (possibly your third year if you have been doing this part-time) and you’ve had the support of a subject mentor, an NQT mentor and help from your usual friendly staff for the entire year. So who’s going to help you now that you are no longer an NQT? Over the summer, I’ve thought about the support I usually give to NQT’s and new staff and how I can improve this support/guidance. This blog is a direct result of my reflections and hopefully, will provide you with guidance and some thinking points for this academic year. You may well be in the same school that you were in for your NQT year but then again it might be a brand new start for you; new school, new colleagues, new students. The following, although not an exhaustive list (albeit a long one!) should help. I still find that I speak to colleagues in my department, around school, at other schools and on twitter, about anything from resources for CPD to lesson ideas. Besides, others may well have taught such a lesson recently and may have hints and resources for you. There are days however, when you will literally need to just stop what you are doing, clear your head and directly ask someone to help you. Do not be embarrassed by this. Remember to speak to other teachers and vent when necessary; whomever you are living with (unless, they are also teachers), no matter how patient they are, they do not necessarily want to hear about Mary ruining her book in your lesson, Keith constantly talking, Sam trying to charm you because of late homework….at the end of each day. Follow this link to read the other bits of guidance on Responsibilities, Cover Lessons, Entry/Exit Routines…. 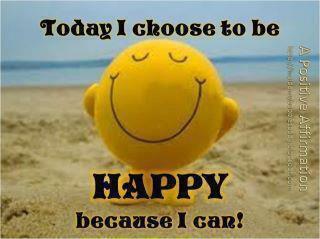 Today I choose to be happy…because I can!